In this volume, written by Geoff Johns and Jeff Katz and illustrated by Booster Gold creator Dan Jurgens, we finally get another ongoing for one of DC’s most beloved bumblers. 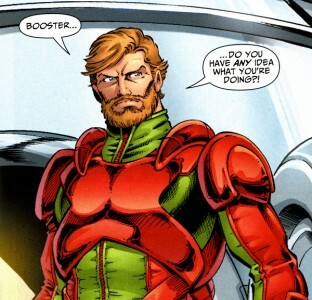 Booster’s only interest, however, is getting back into the Justice League. Unfortunately, the League isn’t exactly trusting of his motives, so they give him one week to prove himself. 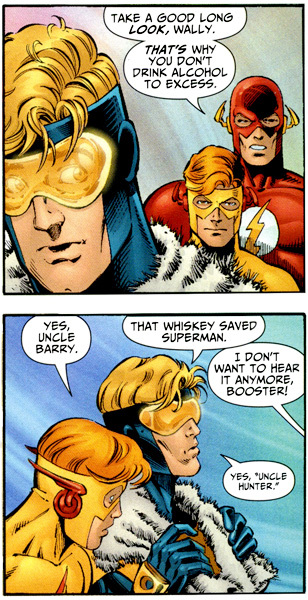 After the week is up and Booster does indeed show his abilities to be a genuine hero, the League grants him membership. When his newly minted JLA Certificate of Membership turns into a death writ for Hal Jordan, the “Greatest Green Lantern,” Booster realizes that something is screwy in the time stream, so it’s back to Rip Hunter, the Time Master, to help set things right. 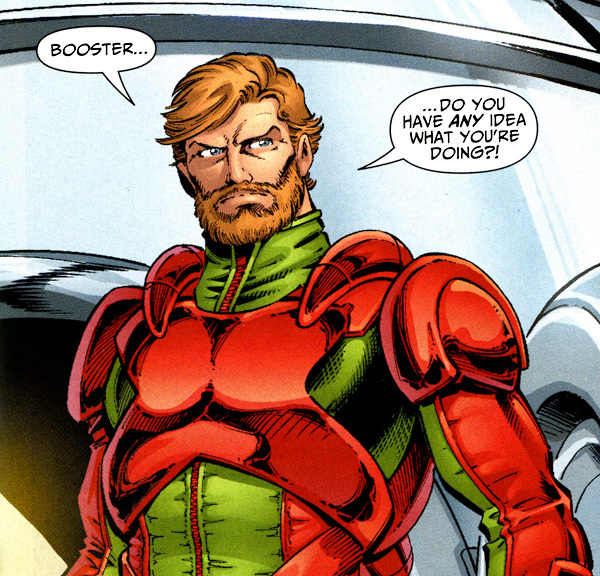 Booster does have a price, though: He wants to save his best friend, Ted Kord, AKA the Blue Beetle. After a brief argument about solidified time and that some things are just meant to be, Rip relents and agrees. Side note: Pay close attention to Rip’s notes scribbled on the chalkboards, as all sorts of clues are dropped for bigger DCU events! As it turns out, there’s someone trying to get rid of the world’s greatest heroes by messing with their pasts and this culprit has stolen the Supernova costume from Daniel Carter, Booster’s modern-day ancestor. This leads to Booster and Rip hopping through time in order to stop the temporal manipulations. It’s a fun study of the origin stories of some of the big names in the DC Universe. A side plot involves Daniel Carter and Rose Levin, the couple who would start the Carter line leading to Michael Jon Carter, or as we know him, Booster Gold. With Geoff Johns at the helm, the interaction between Booster and a pre-renegade Sinestro is a treat. 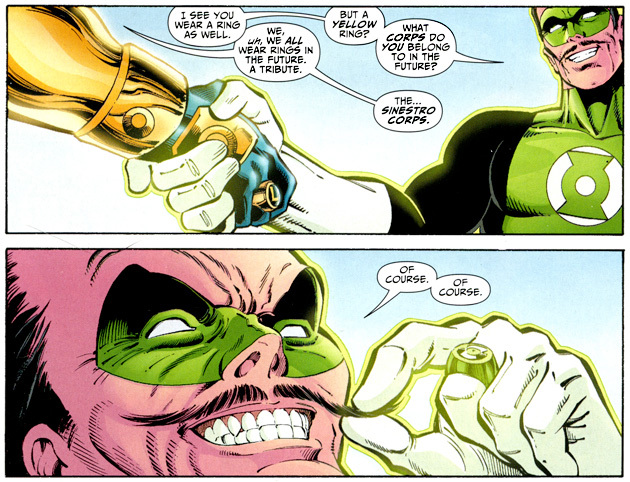 Sinestro is told by “a future-dweller” that Guy Gardner of Earth will be his student one day and will surpass him as the “Greatest Green Lantern.” Incredulous, Sinestro seeks Guy out, but that early interaction would mean Hal Jordan would never be chosen by the ring. So not only does Booster have to stop Sinestro from meeting Guy, he also has to make sure that Guy leaves California so he is not closer to Abin Sur’s crash site and that the ring actually does go to Hal. There are some very good characterization elements here and a really touching scene with Booster and Guy in chatting at a bar. With Hal’s status as Green Lantern saved, the JLA Memberships Certificate changes from a death certificate for Hal Jordan to a death certificate for Superman. However rather than messing with a young Kal-El, the culprit shows a higher level of mastery over the time stream and a greater understanding of the butterfly effect than Rip was expecting. The culprit has decided to go after the country doctor who would deliver Jonathan Kent’s great grandfather to ensure that the baby does not survive and the Kents aren’t around to discover the baby Kal-El when he crashes, but one Lionel Luther is. This shows very intricate planning, focusing on a seemingly inconsequential event, but letting the ripple effect take hold to cause larger repercussions down the line. And of course, the icing on the cake is the identity of the hired gun: Jonah Hex. The culprit makes one more attempt on a classic member of the Justice League, the Flash. And we’re not talking Jay Garrick or Wally West, here, oh no. It’s the big man, Barry Allen, in a storyline that whets our appetite for this classic character who has long been dead in the DC Universe. It’s during this plot that the identity of the culprit in the Supernova costume is finally revealed. The reveal introduces a trio of DC Universe baddies set up to be the antagonists for our hero. After settling everything with the Flashes, Booster is insistent that he goes to rescue the Blue Beetle, but Rip says there is one more person to save: Barbara Gordon was never supposed to be paralyzed and should have always been Batgirl, never Oracle. 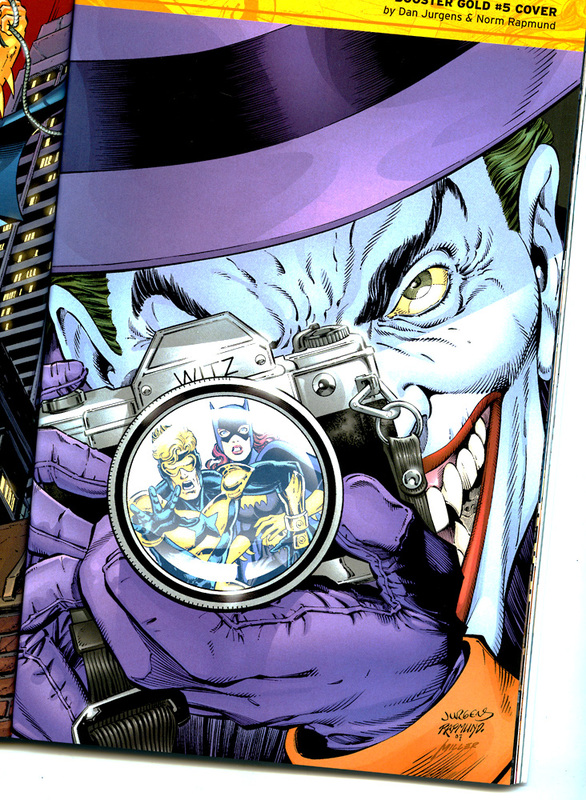 In a darkly fun but mildly disturbing storyline, Booster finds himself in the middle of Alan Moore’s The Killing Joke in an attempt to stop the Joker. After failing and almost getting himself killed multiple times, Rip reveals the truth about solidified time. The present and back cannot be changed. Upon showing Booster that the ever-changing death certificate has reverted back to Booster’s JLA Membership Certificate, Rip lands the point of the lesson: Booster cannot save Ted Kord from his fate. At that exact moment, though, three Blue Beetles burst into Rip’s Time Lab: Dan Garret (Ted’s precursor), Jaime Reyes (Ted’s successor), and a Blue Beetle claiming he is from the distant future. The future Blue Beetle claims that Booster must save Ted Kord in order to maintain the time stream and Booster leaves with the Beetles in spite of Rip’s pleading. It all wraps up in a satisfying fashion, setting up the perfect team-up in the next volume. In fact, the most enjoyable aspect of this collection is running into other characters from the DC Universe. 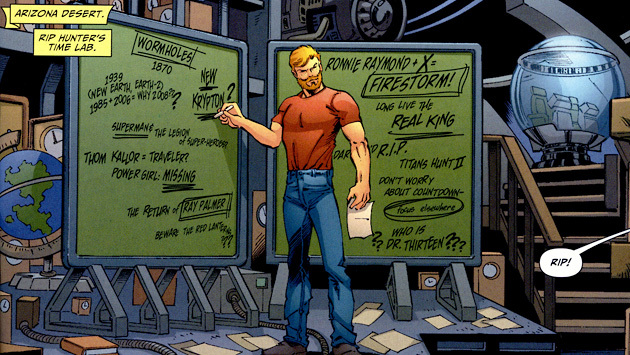 The astute observers will notice little hints of recognition in some characters as they read and that really the most fun aspect: Like with Rip hunter’s notes scribbled on his chalkboard, there’s no such thing as a minor detail in the world of Booster Gold. It’s great to have Dan Jurgens back on the character he brought forth in the 80s and his work shines with the aforementioned detail. Norm Rapmund lends his hands on the finishes. The collection includes full covers (variants too!) as shown with the Joker illustration to the left. An excellent start to this series! This is a really good read and a good build from 52, so I’m going to give this 4 out of 5 stars – only because I’m not giving half-stars. It’s a fun encountering many characters from the DCU – big and small. Geoff Johns drops quite a few hints for future events (Final Crisis, Blackest Night, New Krypton, etc.) and Booster Gold creator Dan Jurgens is back at it without missing a beat. Most importantly, it’s classic time travel storytelling done right! 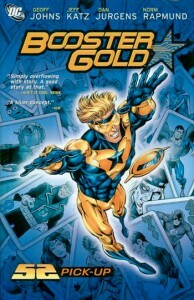 This being the first collected volume in Booster Gold’s break-out series, it lays the foundation for his adventures yet to come, as well as the ones that already happened. Isn’t time travel fun, kids? A must read for those interested in the character, or all the unexplored nooks and crannies in the DCU. If you’re looking for classic Booster stories, you can always check out Showcase Presents: Booster Gold, previously reviewed. His origin and entire original series is contained in that book. As a precursor to reading this book, I highly recommend (in this order) Countdown to Infinite Crisis: The OMAC Project, Infinite Crisis, and 52, especially 52 Vol. 1 and 52 Vol. 2, but I suggest reading 52 Vol. 3 and 52 Vol. 4 as well. It looks like a big commitment, but 52 is quality storytelling – you’d be missing out if you pass it up. You can read the other books from the 52 list, but I don’t think they’re that essential; World War III is referenced in this trade, but only in passing. Infinite Crisis was a big event and you may want to read all the tie ins, but they aren’t necessary to enjoy this book. Besides than that, a passing familiarity with the DCU would help; since this becomes a time-hopping story, Booster interacts with a lot of different characters. For more classic Booster Gold appearances, you might be interested in the Justice League International collections, starting with Justice League International Vol. 1. There was a previous Rip Hunter miniseries as well, called Time Masters. The immediate next entry on the DC Universe List is Green Arrow / Black Canary: The Wedding Album, but you’ll probably want to move on to volume two, Booster Gold: Blue and Gold. Thanks again for submitting this review! I can’t tell you how much I appreciate you guys helping me pick up slack while I’m working on the next big database update. I’m curious, do you think this book would be at all enjoyable to people not already obsessed with DC comics? It looks super-exciting to me, but if I didn’t (for example) know who Jonah Hex was, I under if it would just be confusing. And that’s a good question. I think this would not be the best series to jump into without some basic knowledge of the DCU; it’s almost as if this was written specifically for the fans. While I love finding a book that’s great to introduce my friends with (Batgirl: Year One, is such a book) I like this kind of thing too – it’s just like a really good in-joke with your close friends. Some things can only be enjoyed with a huge amount of build up. That’s exactly what I love about this series: the in-jokes. Thanks so much for the review duncanpr! I fell in love with Booster Gold when reading 52. I had never heard about him prior and thought at first that he was a oneshot joke. The art looks great and I really look forward to picking this up hopefully soon. No problem. I am re-reading the series and need to sit down and do the Blue and Gold review, which I hope to submit by next weekend. Hopefully. I truly enjoy the Booster Gold series…but I’m a sucker for time travel. The late, lamented Chronos series, for example. Great book. But. There is one thing I can’t forgive, and that’s the negating of the very, very excellent Time Masters series. They worked so hard post-Crisis to fix the rules of time travel, and that book was incredible when it came to weaving together DC history…better than any time travel book before or since (including Booster Gold, which unfortnuately, though I love it, smacks a little too much of “making this up as we go along.” The Rip Hunter twist ultimately revealed is too obvious and groanworthy. No, give me Time Masters any day of the week over the revamped Rip Hunter. I haven’t read Time Masters yet, but I’m looking to pick it up from my local comic book shop. I’ll probably have to order it, so it will be one of my February purchases. I’m okay with the twist (don’t want to give away big spoilers, though! ); I think it works. Now time travel is indeed awesome, especially when you think “Okay, how can they do this without messing everything up” or “Let’s see how he gets out of this one!” I think this is actually time travel done right. This first book is playful and helps set up the rules for people new to DCU time travel, while later on, we get to see some more serious side effects of time travel. I’m rather fond. See, I don’t think there really are any rules to Booster Gold’s time travel. You can change the past…except for the things you can’t change…and maybe you can change them…except for when you can’t. Really, the entire premise of the Time Masters series was that time travel was seriously limited (you could only travel a finite number of times via any given method once), and what happened, happened. So the series was designed to give you an idea of how the post-Crisis universe worked. We saw an ancient Egypt with Dr. Fate and the Beetle scarab, the true origin of Vandal Savage, DC’s Western heroes, and even references to what, at the time, was the DC future of Hex, among others. Had incredible guest stars, like Cave Carson. And at the same time the series crossed over with Animal Man and (of all things) Swamp Thing! Dammit, now I need to sit and read it again. I can’t even recall how Rip Hunter was used since. I know at one point he was supposed to be the guide to Hypertime, but that whole concept went out the window real fast. Jesus. Hypertime. That worked well. If there was no chance of changing the present, then there would be risk to the time travel. I don’t know about the rules, but I enjoy the paradox questions some of Booster’s adventures raise. By the way, you just gave me another reason to get my hands on Time Masters: I love Animal Man! ooh yeah, that crossover was totally surprising. But it really explained some events towards the end of Animal Man. Do you mean Morrison’s run? I loved Morrison’s run on Animal Man. yeah, sorry, the morrison run. I haven’t read anything past the trades, though I wish they’d collect more. The same could be said of Swamp Thing, but the stuff immediately following Moore was really quite good. No idea what happened with Animal Man, but I’m curious because of the few times where he does pop up. I haven’t read Last Days yet, either. I know what you’re talking about. While the Time Masters series had its downsides, it had some clear rules that made things interesting. The “person can only travel via one method once” rule, as you mention, made for a feeling of finality after certain events.